I bought this book after seeing somebody else reading it on the train, I was sneaky and peeked a look at the blurb and was instantly hooked. I loved both the title and the blurb and knew that it would be not only a good read but also educational, due to the LGBTQ+ issues it addresses. Leo wants to be invisible and David wants to be a girl. This friendship was one that was so unlikely yet worked so well. Leo is the new kid in school who everyone at Eden Park is terrified of due to crazy rumours that keep spreading about him. 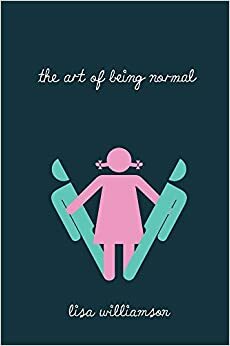 However David is the schools freak show who everyone hates, except his two friends Felix and Essie who are the only ones who know his deep secret about longing to be a girl. I fell in love with both Leo and David’s characters as I found I could really associate myself with the things that they each went through in school. David being different and just wanting to fit in, have friends and crushes, whereas Leo was the side of me that wanted to hide away and just pass through school without any problems. This alone made the book really enjoyable to read, as you can picture yourself in their situations, giving you a sense of understanding to their emotions and feelings. The book took the writing style of dedicating chapters to each of the boys, so their side of the story and their thoughts could be expressed. This is something I thought was a very good writing decision, as it meant that you can experience two different views on school and how they survive it despite what they’re going through. I have seen this style a lot and I often find it frustrating as I become attached to one character more than the other and therefore find myself rushing through chapters. Yet, this never happened in this book. I was involved with both characters right from that start and wanted to know each of their stories to tell. During part of the book I did start to think how this situation would be extremely unlikely in real life and started to doubt whether it was useful to read. That thought was quickly removed, as I then realised how helpful this story is for those going through similar things that Leo and David are. It gives people characters to relate to and also provide a lot of information on a much more serious topic. I really enjoyed reading this book and think that it is a great read for people who are either in school now or those like me who have finished school and loved relating and looking back at those times. I’d definitely recommend this book, especially those who are transgender or are even questioning it, as the story is educational and inspiring. This sounds like a really interesting read I will have to add it to my Goodreads list.